Many people will realise that Derek Bailey died early on Christmas Day morning, 25 December 2005. Around 18 months ago he had difficulty holding the plectrum for long periods, at first thought to be carpal tunnel syndrome, but his health gradually deteriorated during 2005 until he was diagnosed with motor neurone disease in October. Throughout all this time he was supported by his wife and co-organiser of Incus, Karen Brookman. He died at home in London. The funeral will be held on Thursday 5 January. There will be no update to the site during January, as a mark of respect for an indefatiguable and enquiring musician, a remarkable improviser, an innovative guitarist, an unstoppable and witty raconteur and writer, and a very dear friend. 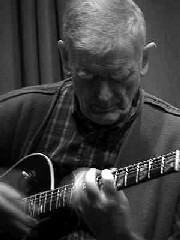 On December 25th, avant/jazz/guitar legend Derek Bailey passed away at the age of 75. He suffered what was at first diagnosed as Carpal Tunnel Syndrome for the past few years and eventually succumbed to motor neuron disease. He was living in Barcelona, Spain for the past few years, but was back in London when he flew from this world. Derek Bailey was perhaps the most influential and adventurous experimental guitarist to come from England, evolving out of the trad-jazz scene of the fifties into the avant/jazz scene in '60s London. By the late sixties he was a member of the Joseph Holbrooke Trio (w/ Evan Parker & Gavin Bryars), Spontaneous Music Ensemble (w/ John Stevens & Trevor Watts) and Music Improvisation Company [with Parker, Hugh Davies, and Jamie Muir], which later became the amorphous Company under his leadership. These groups were at the birth and center of the British free-jazz scene. Derek Bailey and Evan Parker started their own record label called Incus in the early seventies, one of the first artist-run outfits. Although Derek and Evan had long since parted ways, the Incus label continued with 60+ releases, many of which are now sadly unavailable. Derek's playing was absolutely unique and idiosyncratic - nobody sounded quite like him. His style was constantly evolving and, when playing electric, he developed a distinctive way of using feedback. Although he played with the best members of the British free/jazz scene, he also forged relationships with a number of European players like Han Bennink & Peter Brotzmann, Japanese free players like Kaoru Abe, Toshinori Kondo and Motoharu Yoshizawa, as well as American improvisers like Anthony Braxton, George Lewis and John Zorn. Derek organized an annual festival called Company Week in the 80's & 90's, which brought together a unique group of international improvisers from varied backgrounds. What set Derek apart is that he was always 'game' to play with just about any "interesting" player, no matter where they were coming from. Due to his friendship with John Zorn, Derek had performed and recorded with an unlikely cast of characters: The Ruins, Haino Keiji, Jamaaladeen Tacuma & Calvin Weston, Tony Williams & Bill Laswell, et al. Over the past decade, Derek & Zorn organized a few Company festivals at Tonic, again putting together unrelated musicians for their first time. At the last of these festivals a few years back, Derek brought the members of IST (Simon H. Fell, Mark Wastell & Rhodri Davies), as well as the veteran tapdancing legend Will Gaines. Although Derek enjoyed playing with other avant guitarists (Eugene Chadbourne, Henry Kaiser, Fred Frith, Noel Akchote & even Pat Metheny), he has played more duos with drummers than any other combination. Check out this list: Tony Oxley, Louis Moholo. Han Bennink, John Stevens, Eddie Prevost, Cyro Baptista, Gregg Bendian, Susie Ibarra, Jamie Muir, Ingar Zach, Shoji Hano & Michael Welch. Other amazing duos would include Cecil Taylor, Steve Lacy, Evan Parker and Joelle Leandre. Derek had such a dry yet gentle wit. Morever, his playing will always be a constant source of inspiration to adventurous musicians and listeners the world over. He will be sorely missed. Leggo con sgomento della morte del chitarrista britannico Derek Bailey, avvenuta ieri a Londra dopo un veloce rientro da Barcelona. La notizia non è ancora confermata, ma temo sia così. Era da tempo malato, e probabilmente le cose sono precipitate nelle ultime settimane. Una perdita immensa, Bailey era un musicista geniale. 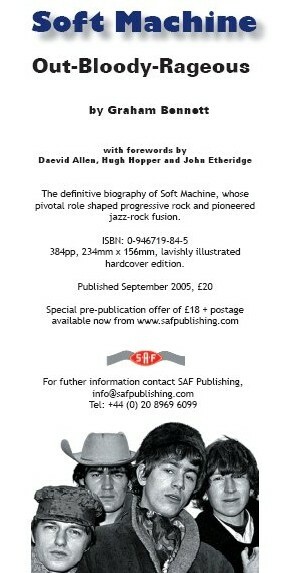 The definitive story of Soft Machine with forewords by Daevid Allen, Hugh Hopper and John Etheridge. Soft Machine were one of the great British pioneering bands, they played a pivotal role in shaping psychedelic rock, progressive rock and jazz-rock fusion. Out-Bloody-Rageous is the definitive biography of this ground-breaking band. Based on extensive interviews with members and associates of Soft Machine, it is illustrated with over eighty photographs, posters and clippings and includes a full Soft Machine family tree, concert file, discography and sessionography. Out-Bloody-Rageous is essential reading for any serious fan of rock or jazz. Out-Bloody-Rageous traces the lives of Soft Machine’s members, pieces together the band’s serendipitous formation and colourful career, and unravels the truth, the mystique and the legend behind this most elusive of bands. It recounts the incidents and internal tensions that led to an astonishing twenty-four different line-ups and places Soft Machine’s development in the musical and social context of the time.